Follow Winemaker Matt McKinney as he takes us for an inside glimpse of the international world of wine and the local wine scene of Santa Barbara County. My goal, since beginning my path as a winemaker and moving back to my home town, has been to do harvest at two of the top wineries in Santa Barbara County. Those two wineries are Dierberg/Star Lane & Dragonette Cellars. I am delighted to say "Mission Accomplished!". In 2015 my experience with Dierberg/Star Lane was exactly what I was looking for to be working under a prestigious winemaker and at a winemaking institution. Dierberg/Star Lane is one of only a few elite wineries that are able to create and attract the highest level pedigree winemakers. Star Lane was definitely that. Working under Tyler Thomas who has a master's degree from UC Davis in Viticulture/Enology & Plant Physiology was enlightening to say the least, both from a winemaking and a business management point of view. Tyler, as both the head winemaker and vineyard manager, runs a no BS, efficient, and precision focused operation, managing close to 40 full time workers in the winery and vineyards. The production facility at Star Lane, with a half mile of underground cave cellars is undeniably the most impressive winery in Santa Barbara County (the one other rival would be Presqu'ile in Santa Maria Valley). I told Tyler on my job interview that Star Lane reminded me of visiting UCLA's campus on my recruiting trip out of high school. It was the type of "Big Time Division 1 Institution" that got me excited - the best of the best and that was what I wanted. Fast forward to 2016 and the best of the best takes on a whole different concept. 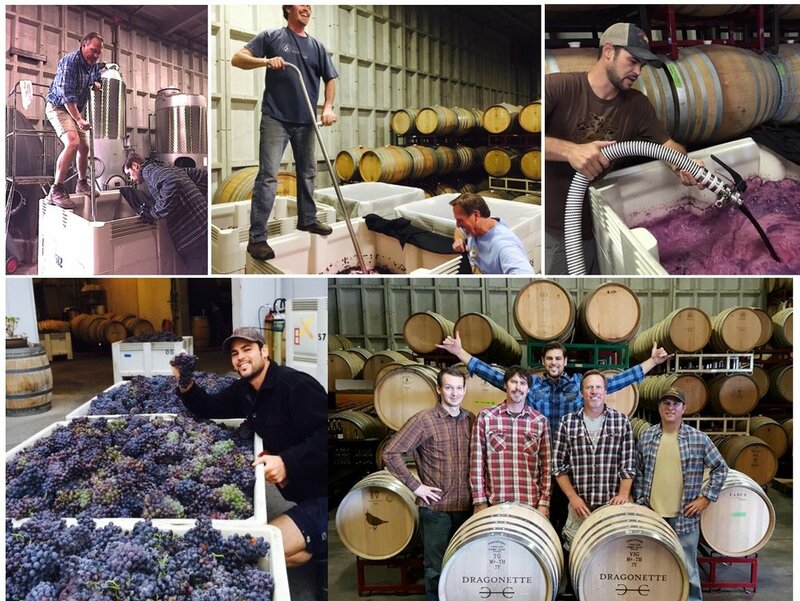 Dragonette Cellars production is one fourth the size of Star Lane's and their winemaking facility is located in an unassuming industrial building in Buellton, California. It is right down the street from the 805's iconic Firestone Walker Brewery. Positioned caddy corner to Valley Automotive car repair shop. The exterior of Dragonette Cellars is the polar opposite of the the Napa Style Chateau Winery or Star Lane's Castle production facility & vineyards in Happy Canyon. But it's what is on the inside that really counts and Dragonette delivers when it comes to the best people and best wine in all of Santa Barbara County. Brothers John and Steve Dragonette and close friend Brandon Sparks-Gillis founded Dragonette Cellars in 2005 after having worked together at the renowned Wally's wine shop in Los Angeles. Their shared passion for great wine brought them to wild, windy and remote northern Santa Barbara County where they spent the next several years seeking out extraordinary, cool-climate vineyards. What I love so much about these guys is that they started making wine in their garage similar to myself with all the small scale winemaking equipment and have built their knowledge and brand from the ground up. They followed their passion, pushed aside the naysayers and accomplished their dream. Pound for pound I believe Dragonette has the best wines in all of Santa Barbara County. There are no sub-par wines on Dragonette's list, every one is uniquely distinct and superb, and that attention to detail and no compromising mentality is what I really resonate with for my own family winery. Over half the wineries in Santa Barbara County are "Virtual Wineries"
Dragonette Cellars is known as a "Virtual Winery" which means they do not own any estate vineyards, they source all their fruit from other vineyard owners. What sets them apart is that nearly all of their vineyards are leased (by the acre) as opposed to the standard (by the ton). Therefore they handle all the farming aspects of the acreage they have under contract. This control and flexibility (also the ability to stop working with vineyards who do not efficiently manage their vineyards) enables the Dragonette team to source grapes from many different soil types and climates throughout the county. As "vignerons", (both cultivators & winemakers), they have committed themselves, above all else, to the mindful farming of precise blocks in exceptional vineyards for low yields and high quality offering true distinction of place or "terroir" in all their wines. Although Dragonette does not have a UC Davis winemaker with a Master's Degree, they do have a future Master of Wine in Brandon Sparks Gillis. Brandon has already passed his first level of the intensive exam. There are currently 354 Masters of Wine living in 24 different countries and Brandon seeks to become the newest member of this elite group. Anytime I had a question that needed answering Brandon was there with an answer. His commitment to his craft and his field of work is obvious in his work ethic and I feel blessed to have been able to absorb some of his knoweldge during the 2016 harvest. In Dragonette's winery I spent 10-12 hours a day before going home to tend to my own vineyard and winemaking duties. The vibe was always fun even when things got hectic and a little stressed out which is inevitable with machine malfunctions and the never ending logistics of shuffling around thousands of pounds of barrels, tanks, grapes and wine until the sun goes down. I have worked for and surrounded myself with a fair share of bosses through college and professional sports and now in the wine industry and the theme that describes the Dragonette winemakers the most is "Lead by Example." These guys do all the hard work and take pride in doing as much of the hard labor as the people working for them. Their style of leadership is to inspire through their own actions. It works. McKinney Family Vineyards is a boutique winery located in Santa Barbara County California, in the heart of Santa Ynez and close to Los Olivos. McKinney Vineyards is focused on limited production hand crafted wine, specializing in Viognier, Sauvignon Blanc, Chardonnay, Pinot Noir, Sangiovese, Grenache, Syrah and Cabernet Sauvignon. McKinney Family Vineyards LLC. All Rights Reserved.